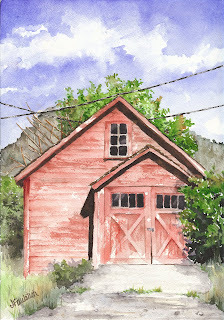 This little red garage in Jackson was so appealing, with its small, neat proportions and peeling red paint. When I came back with the camera to photograph it, there was a car in front-I could have just edited it out for the painting I planned to do, but I decided to walk into town and try again on my way back to the Buckrail Lodge. When I passed by again, a man was getting into the car-he went back in the nearby house and came out to the car again. Meanwhile I was skulking around down the street, looking rather suspicious, I imagine, as he was watching me and seemed reluctant to drive away. I finally began walking away, and he drove off. I hurried back and got several good shots. There were actually 3 more overhead wires, but I omitted them. I used drybrush, and wet-in-wet to capture the wood, and kept it pretty loose-for me!In Mike Bailey's workshop he talks about "exalting the mundane." This homely little garage gave me that opportunity. Hi Janice! This turned out really nice! Love it!